Upgraded VIEW+POOL Home With A DOWNSTAIRS BEDROOM! Open Floor Plan & Kitchen has been completely remodeled including hardwood flooring, "one of a kind" Italian granite countertops, LED lighting and all new stainless steel appliances including a gas Thermador 5 burner cooktop. Formal living room with fireplace, dining room, Built-in elegant bar and Vaulted Ceilings! Family room with 2nd fireplace and french doors to rear yard. New hardwood flooring and paint throughout the home! Large DOWNSTAIRS BEDROOM with ceiling fan. Master Suite upstairs with large double door entry, recessed lighting, ceiling fan, large bay window with city views. Completely remodeled master bathroom top to bottom with highest quality tile, multiple shower heads including ceiling mount rain head, glass divider, cabinets, LED light fixtures, etc. This is a must see! Built-in Library and office area looking over the living room with natural lighting. Large bedroom with door to private deck. Fleetwood dual pane windows, Pella French doors, Crown Molding and Laundry chute! High efficiency dual zone A/C, NEW ROOF IN 2013, POOL W/ WATER FALLS and recently redesigned and upgraded yard with pavers, pergola, BBQ area, sitting area, firepit, new gates on both sides of home, grass and surrounding greens. This yard is designed to watch the sunset view while enjoying the pool or entertaining guests. 3 car garage! 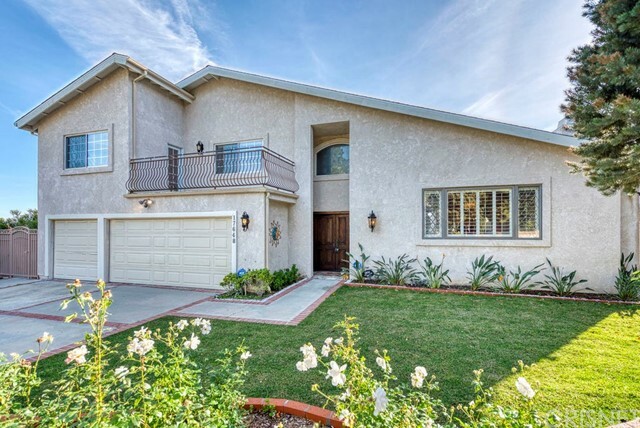 This is a rare find for this highly sought after private area of Granada Hills.